A shot of a marathon, a melting pot of people. The Illustration became an infinite pattern. Fausto Montanari is a freelance illustrator and director. He has a strong interest in human beings and finds a permanent source of inspiration in human behaviour and our culture. The starting point for his works is the surrounding reality, the same reality that he then transforms in a perspective on the border between reality and fantasy. 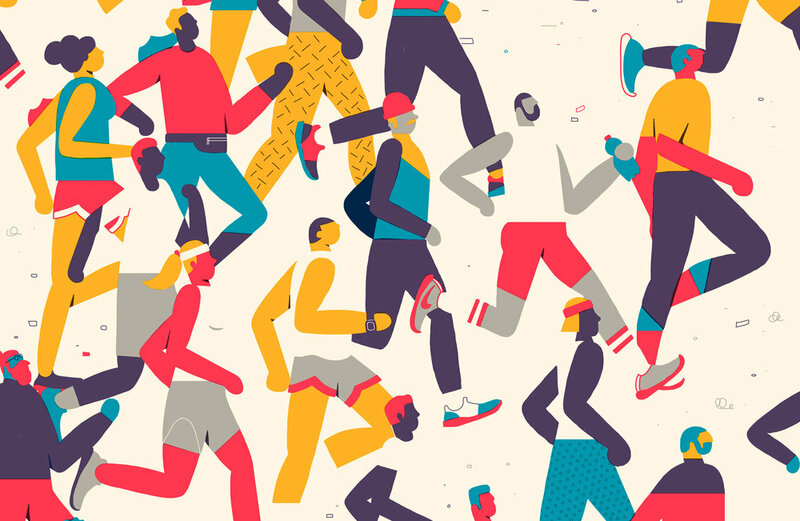 He expresses himself through easy shapes and flat colours. He has participated in solo and group exhibitions receiving various awards and recognition. Random fact about you? Don’t say pizza or you will switch off my brain! How did you get into illustration? I started drawing and never stopped! What tools do you use to create your work? Digital, but I do a lot of work with traditional techniques and would love to do more and more of this in the future. Who or what inspires you the most? People and travel. Favourite website for inspiration? Twitter, probably. Lots of random thoughts and musings and opinions. What would your dream project be? I really would like to direct a promo ident for MTV and illustrate a cover for The New Yorker. Where can we see more of your work? Instagram.